Yesterday I got a call from Sri Lanka an old friend S.mit who wanted his wife Ar..na to see me since she came to visit her mother in Hyderabad. Ar..na came around 10am on 13th March 2019 her eyes were wet and the nose was running. I thought it was dust allergy. She was overwhelmed by energy in my home and felt the presence of divine entities around. We shared our stories of life. There were many ups and down with divine blessing as if she was living 2-3 lives in one life. She is a psychologist, trainer, Reiki Master, Hypnotist, and Past life regression. The most interesting experience was when she once felt the presence of Satya Sai Baba with two haves Jesus and Sai in one and later as Siridi sai, Satya Sai and Jesus in one. I told her the story of Sri M who was a Hindu Yogi and disciple of Maha Avtar Baba in his past life and disrespected a Peer who jumped into Alakananda river and died. This life he has to take birth as a Muslim to experience Islam. But he met his guru Maheswarnath and leading a life of Hindu Yogi. When Ar..na was leaving my home two peer babas came with a begging sheet. When she put some money they wanted more and bigger amount. She took out Rs 500 and gave to them. Peer folded the note into several folds and handed over to her hand and ask to close with another hand and puffed. When she opened the hand the note changed into an amulet. He asked for more money and manifested more items. After she went they came to me and manifested many more items from the note. I have heard and read many such manifestations stories. In July August 2005 I went to a village of my colleague Tishari in Sri Lanka. There was a monk who used to get divine possession by Maa Bhadra Kali every Wednesdays day and Saturday. During possession, he would heal and answer questions of the crowd. It was Wednesday and there was a large crowd with offerings. I didn't have any question to ask. After a long wait, a Monk came out of the temple and went to the cliff and started praying. Soon he was possessed and came back howling to the temple. There was no queue the monk was calling a person by name or some identity. After some time, I was called as a foreigner, as soon as I entered the shrine with Tishari the monk was in Meditation speaking in Sinhala, looking at something he asked me. Your house is like this and a whose photo is there? I said, Lord Krishna. You are meditating? Yes, why is it not good. He lifted his right hand and from the air, Vibhuti came in his hand which he gave to me in a paper and ask to take during meditation. Tishari was poking me to ask some question. How long I will stay in Sri Lanka I asked. 2 years, 2 months, 2days, 2 hours and 2 min. This is a very peculiar way of answering such questions. Maa Kali also gave such answer to Rhythm about his time of death all in five. Then I asked what will I do after going back. He was showing with his hand you are flying frequently, for some job. Where? The US. Actually, I came back in 2007 August to Hyderabad and after 3 years joined GNRC Guwahati Assam and flying every week or two from Hyderabad for the next 10 years. 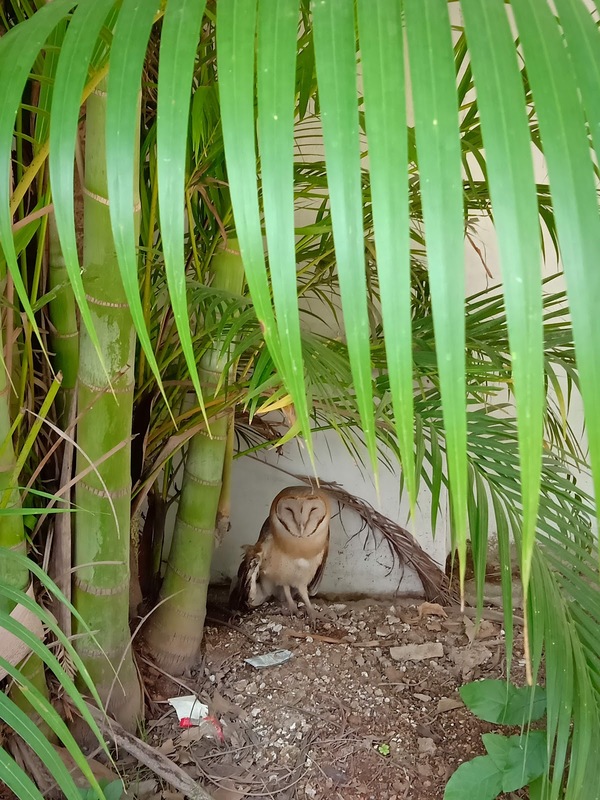 Yesterday 31 Jan 2019 at 4am a wounded little Barn owl knocked at the door of Govind. He rescued it and kept in the Garden to get some food. It was not able to fly due to wing injury. Not able to hunt and drink. Next day Govind took it to the hospital but there was no doctor. We dressed and gave Arnica 10M, it opened eyes but very weak. Vomited water. By afternoon became weaker, tried to feed glucose water and gave next dose of Arnica but it gasped and left the body by 3pm. Why it came and died at our home no clue? 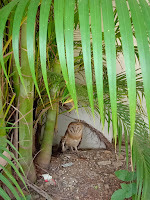 Owl coming home in India is believed to be auspicious but wounded owl die at home why? It has also shadow meaning just opposite. Laxmi became well after receiving a homeopathic remedy for her bronchial asthma and fear of cold. This time she decided to do Laxmi Puja in Kartik month. On the day of Divali, she seeing Ma Kali in her dream as my wife and next day Maa appeared in Govind's her husband dream and slammed him on the bed around 3am. Since then he developed severe vertigo and vomiting. I gave Bryonia and my wife Stemetil but till Laxmi went upstairs and Apologized by rubbing the nose in front of Ma Kali Govind could not get up. Evening again he developed vertigo and Laxmi had to apologize again with relief of his symptom. Ma Kali doesn't want them to do any other Goddess puja. She had similar experience before. One evening during Sunset at Panchakanya Baba (Bhrigu Giri Maharaj) was telling a story of resurrection of a boy casually. Dilip family migrated from West Bengal. He was living a life of a punk and became Baba's Bhaka. A sadhu who was living in Dilip's house cursed him to be childless when a temple was not constructed according to his liking. Dilip did not marry since then. Sabita came to study in Guwahati and got married without her consent to a manipuri boy who died within 15 days due to dog bite. Sabita came crying to Baba for a place to live. Baba suggested to stay at Dilip’s house in a hut left by sadhu. Dilip did not like it but could not help since it was Baba's word and Sabita was recalcitrant. After six year they got married in 1979. Once Sabita came to attend a puja after bathing in Panchpushkarni Kund in Panchakanya Dham and sat behind Baba. After puja Baba threw a flower blessing for a child which fell on the lap of Sabita. She was blessed with a female child who died and then a male child who was 2 years when he also died. Sabita and Dilip outraged in sorrow. Dilip locked Sabita in a room and went to Panchakanya. After puja when Baba saw Dilip sleeping with sword in hand, he gave a flower with all his past accumulated punya to revive the child. It was more than four hours since child had died, relatives and friends were gathering for last rite. Dilip made a paste of flower and put on the lip of the dead child. Slowly child started moving his lips and then limbs which were cold and stiff. They started heating cold blue body of child with heated salt in cloth. Tarang resurrected without any brain damage and living happily with his parents. We visited with Maa and Basu on Jan 29th 2017. Mrs S Shukla is 21 years doing MA english. She came from Jabalpur with his father and our old friend a Homeopath doctor for Past Life Regression. S was suffering from compulsive psychogenic polydipsia, (drinking water) and polyurea. She has very low self esteem and unable to concentrate in studies. They have tried homeopathy, psychiatry, psychology, astrology, and any other method advised by friends. They were planning to see me for 6 month which my sister and I was avoiding. I do not do PLR on demand but all my cases were spontaneous and surprise to me. On 31st Dec 2016 they came late night by train and got up late. Our first session was very informal as usual sitting in front of devi in my spiritual treatment room I was narrating how this room was turned from a clinic to puja room in 2007. There was sudden burst of crying spell which lasted for some time and then she started feeling cold. We covered her with two blankets and asked to close eyes and visualized she saw light and on guiding there was a glimpse of mouth of tiger, lotus, Devi Laxmi, Ganesh, Lord Shiva, Golden ornaments and himalaya. She had fear of some black shadow with hollow eyes was watching and sitting. She also saw a side face of a young girl. There was fear throughout session but relaxed at the end. Session lasted for one hour without any concrete answer except I came to know that she could be hypnotized. Evening we sat in meditation I could go into deep meditation and expected her to go to meditation but she was sitting open eyes. There was no vision no fear. When I told about futility of session she burst into crying for long time and slept without food. Next morning I was meditating in all four temples and asking to help me to find the answer. We did session upstairs in Kali Temple. I asked her to close eyes and visualize. But she lay down without any visualization. Her father went into deep meditation and saw same black figure scaring her mother when S was in womb and during her delivery. Her mother has passed away last year after long suffering from breast cancer. After session was over I suggested Ms S to accept her body as it is and not to brood too much about her illness. She burst into anger and asked her father to leave the house immediately since no one was understanding her problem. It was clear after these two session that there was a black energy chasing their family and causing mental and physical agony. There is big task ahead for removing the black energy. Dr Santanu suggested to start Clonazepam with Mirtazepine in the mean time to tame her down. Effect of black energy on my home: First there was a small bajaj geyser stopped working, after they left two electric iron stopped working. I was having heavy heart with palpitation of impending fear and then developed sore throat and fever. Govind and Laxmi were getting nightmare. Govind was choked by an unknown person in dream and laxmi also got negative dreams. Can a man Suicide when possessed? Dr D came to me to learn meditation. Meditation is not to be learned like sleep, it is natural and when you learn to meditate you never continue unless it is a inner call I said. There is a reason she replied. "I lost my husband three months ago. He was very nice person. Our relationship were very harmonious. He loved me very much. I received a call from him one hour before his death. It was devastating and unbelievable to hear the way he lost his life. We came back from Cambridge, he was software engineer. Not very happy after joining job in Delhi, but not sufficient to take his life. My husband was living with his younger brother a friend. That evening he was alone, at 8.30 pm he called his brother. What time they are expected back. In 3 hours time they replied. When they came back home door was locked and found my husband body hanging from a half open door of a small room. Why should he kill himself, was it suicide of homicide, what was the intention to kill such a innocent man. He was very spiritual, meditating and would call me daily. I want to know who has killed him." I explained her it is difficult, but if she goes in deep trance there is a possibility. She went into trance by progressive relaxation. It was all dark, on guiding to go up in the sky she could fly for a distance then something was pulling her back. Trying to regress her was also unsuccessful. She decided to drop me back home. On the way we were sharing our experience. "My four year old daughter says my dad was killed she said. Some time she dreams of a necked man coming out of wall and pull her hair. She is very scared of such experience. Second type of dream is of her father visiting her. And the third and most significant is Lord Shiva comes out of a photograph and sits near her bed. She is not scared to last two types of dream. She is mature for her age." Shall I visit your home I said. While going to her home she explained about her family. "Six month ago I lost my father, he was admitted in GNRC and you had visited for alteration of consciousness. It was hyponatremia and later acute myocardial infarction he succumbed. He was healthy and there was no reason for him dying unexpectedly like this." There is high suspicion of black magic for property. Practice of black magic is common in Assam. Mayong (Land of black magic) village of Morigaon district in Assam on the bank of Brahmputra 40 km from Guwahati was once considered as Cradle of Black Magic in the country. During the medieval period in ancient India, Mayong is said to remain the Indian Capital of Black Magic and Witchcraft. Several stories and legends are there pertaining to the name Mayong. Here are some of them. Some people say the name Mayong comes from the word Maya since it is considered as the land of illusion. When the five states of Northeastern region of India was under the common name Assam (except Manipur, Tripura and Sikkim),Dimasa people from the maibong clan inhabited there. The area, being hilly place, was full of elephant and the Dimasa word for an elephant is Miyong, hence few believe that Mayong was a corruption of the word Miyong. Legend is that Mayong refers to “part of goddess Shakti”. Maa for mother shakti, Ongo for part, hence the older generation calls goddess Maa. Mayong is full of supernatural stories. It is said that people came from far off and abroad to learn magic here. Except a few, the spells were not written but passed from mouth to mouth from generation to generation. According to history, Narabali or human sacrifices were carried out in connection with the worship of Shakti till the early modern period. Excavators had recently dug up swords and other sharp weapons that resembled tools used for human sacrifice in other parts of the country. While returning from Guwahati I met Sai Gouripala (He was my student in Cognitive Neuroscience in IIIT Hyderabad doing PhD) in flight from Bangaluru to Hyderabad on 7th Feb 2016. After listening to our Badrinath Yatra in July 2015 for meeting Mahavatar Babaji in Vyas Gupha on Guru Purnima . He narrated his story back in 1990 when he was working in US. He had read Autobiography of Yogi. James one of his friend and a photographer wanted to visit India. Sai got leave for 2 months. James was told by a Retired Army General Taylor in Puttaparthi that he had a purpose in life during his last visit. Sai and James with General went to Rishikesh to meet Mr Shyam who was calling General Taylor as Guruji. His house was a small temple of Lord Krishna. They all went to a Gupha called Patal Bhubaneswar near Nainital and met two yogi living there. They interviewed them. One of the yogi took Sai to a cave and shown picture of Mahavatar Babaji and said he is reborn as Yogi. He also introduced Taylor as Lahiri Mahasay reborn. There was a pujari in the cave as 8th generation appointed by some King. He was local postmaster. 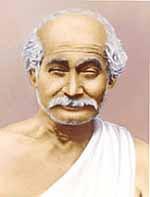 The second yogi was an astral traveller. He talked about Sai's mom's health problem. Sai was not too keen to stray away from his Sai path. They saw a small Kali temple garlanded by army medals. In 19th CA British soldier ship was saved by Ma Kali, since then British army pay homage to Ma Kali with medals for saving their lives. Gen. Taylor became Sai Bhakt after his driver was saved from fall in that area and later he had a dream of Patal Bhubaneswar. Swami mentioned about it that he had to do some job. Later General discovered and developed that area for more people to visit.